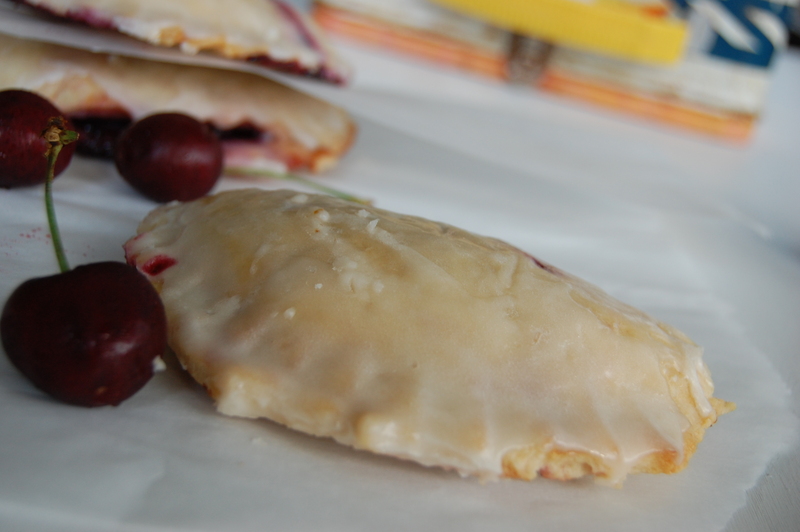 Cherry Rose Hand Pies, a Homemade Childhood Favorite! 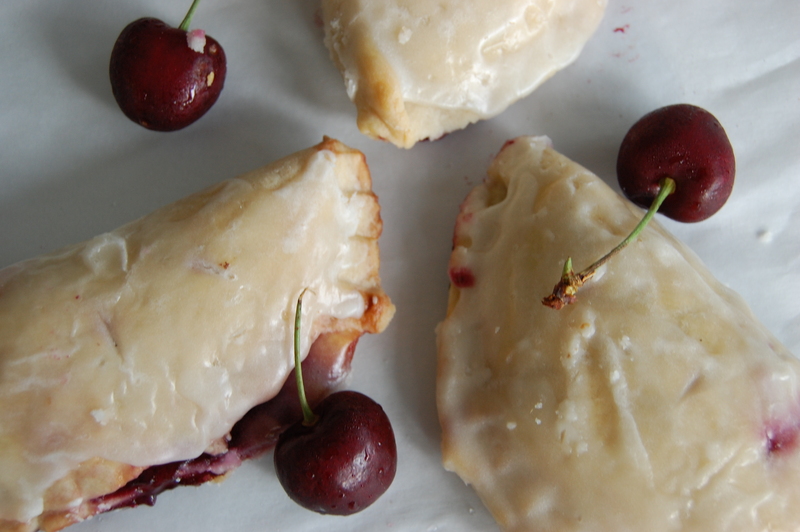 Cherries are in season, and to make these a little more special I added the rose water. The flavors blend perfectly, giving a floral finish to the cherries. If you are on Team Hate Rose Water, substitute vanilla extract and double the amounts. I do know many chefs that detest rose water, but one chef I know recently told me, “Those haters just see it misused a lot”. A little goes a long way in the case of rose water. In a stand mixer with the paddle attachment combine the flour, sugar, baking powder, and salt until mixed well. Add the butter and shortening into the bowl and run until it looks like coarse meal. Slowly add water in until the dough comes together. Remove the dough from the bowl and knead into a ball. Wrap in plastic and refrigerate for an hour. While the dough rests, start the filling. In a medium sauce pan, combine the cherries, sugar, rose water, and salt. Over medium heat allow the ingredients to simmer for 5 minutes, stirring well. As the juices from the cherries release, remove 4 tablespoons of the sauce and place in a small bowl. Add the cornstarch into the bowl and mix well. Stir the cornstarch slurry back into the sauce pan and continue to simmer, stirring constantly until you have the consistency of pie filling. Remove from bowl and place in refrigerator to cool. To make the hand pies divide the dough into 8 pieces and roll them into balls. On a floured surface, with a rolling pin, start flattening the balls into 6″-7″ circles. Place them on a parchment paper lined baking sheet and refrigerate for 30 minutes. Preheat the oven to 375. Remove your dough and allow to stand about 5 minutes. In center of circle add 2 tablespoons of the filling and fold in half. Crimp the edges with a fork and poke the fork into the center of each pie to allow the steam to exit. Place the pies back onto the parchment lined baking sheet and place in oven. Cook for 30-35 minutes, until the crust is golden. While the pies are baking, make the glaze by mixing all the ingredients in a small bowl, stirring until smooth. Once the pies have been removed from the oven, allow them to cool slightly, and then spoon pour the glaze over them. Allow the glaze to set while the pies continue to cool. Makes 8 hand pies. These can be refrigerated up to a week or frozen up to a month. 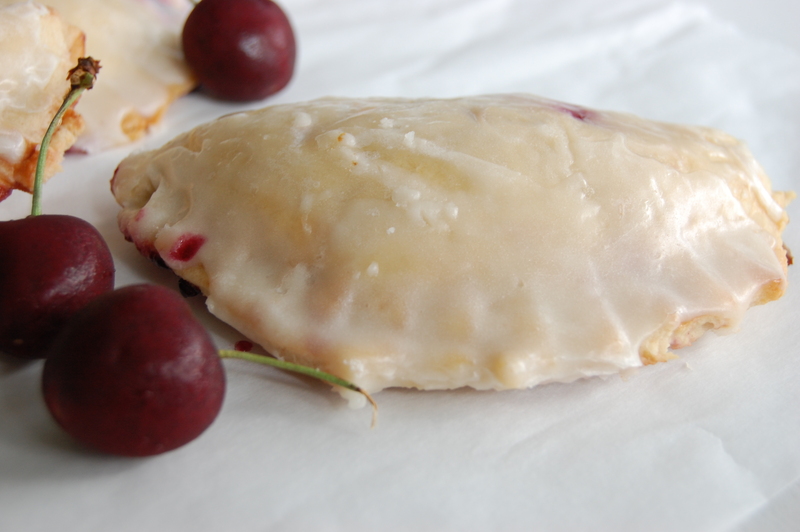 I love the portability of hand pies, easy and convenient. But most of all, I love being taken back to the special days of my childhood that I would find a hostess pie in my lunch. Happy Independence Day to all! Sir Wes LOVES the 4th of July, I secretly think he has the goal to participate in Coney Island Hot Dog Eating Contest, which just thinking about makes me a little sick. Most years we stick with a batch of Sangria, a cookout and a trip down to Celebration to see the fireworks instead. Yesterday I made a dessert that would be perfect to pack on any picnic, park, beach, or backyard. Fresh peaches and a leftover pie dough sheet in the fridge, perfect for this all American holiday! I had a bit of fresh tarragon staring at me from the refrigerator shelf , so I added that into the filling. I love adding herbs to fruit, they just add a different, refreshing twist. Place all the peaches, sugar, tarragon and water in a heavy saucepan over medium heat. 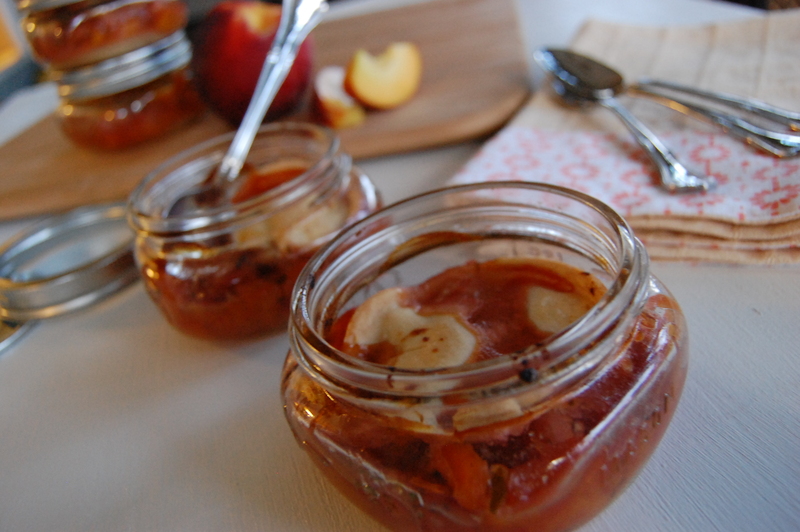 Allow to gently simmer, pulling out the juices of the peach, with the sugars thickening the juice. After 15 minutes remove from heat and cool in refrigerator. Roll out dough to a standard pie thickness, cut out 8 circles of dough by using the top of the mason jar. 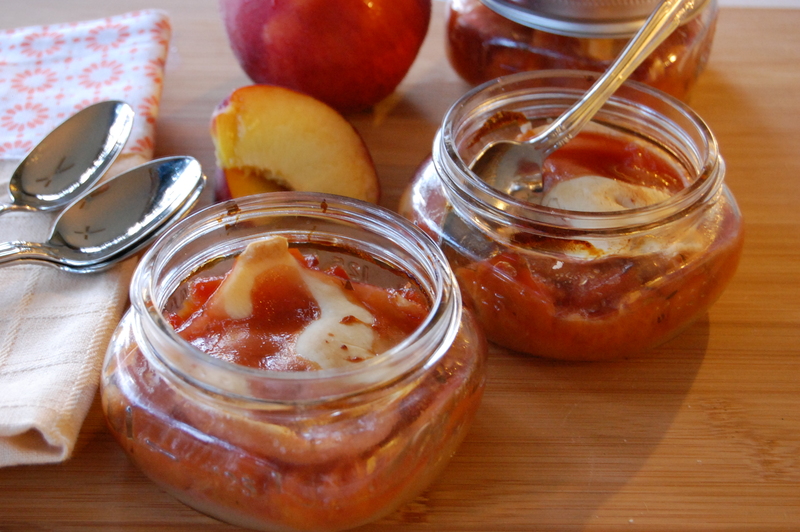 In each jar place a cutout on the bottom and scoop the peach filling into the jars. Top with the remaining dough. 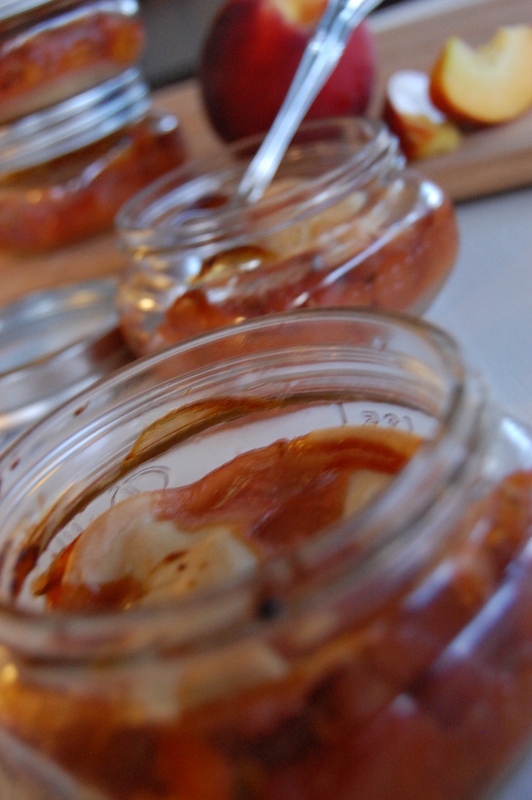 Place mason jars on baking sheet and cook in oven for 30 minutes at 425°. The smell of peachs makes my mouth water! Happy Independence Day, may we all appreciate the freedom we have, thanks to the service men and women who have provided it so courageously!